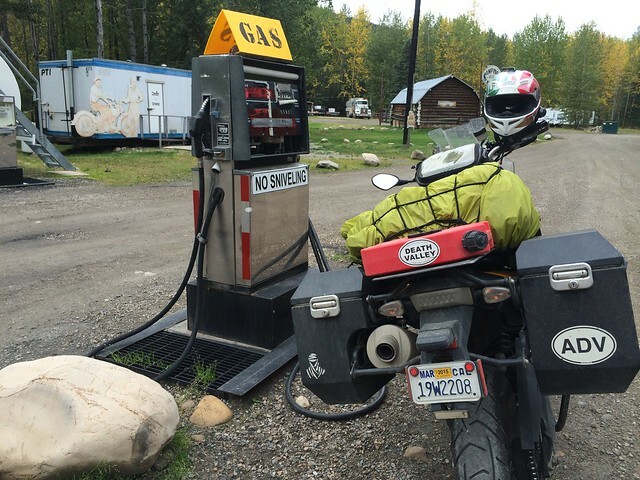 This is a continuation of my notes from my 2014 ride from California to Alaska. 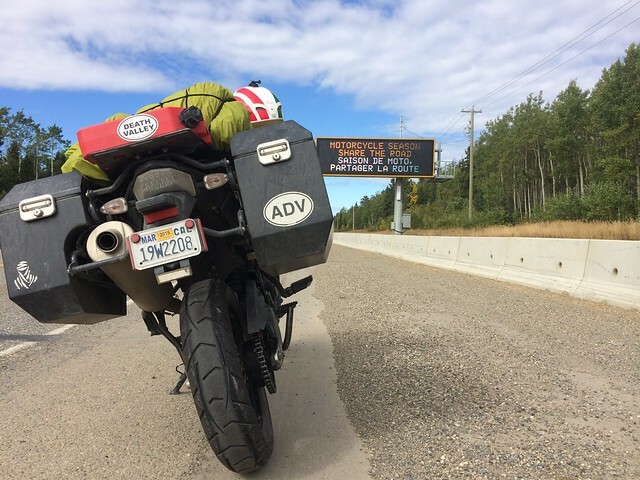 My previous posts (post 1 and post 2) describe my journey so far from San Jose, California to the start of the Alaska Highway at Dawson Creek. I reached Fort Nelson early today. 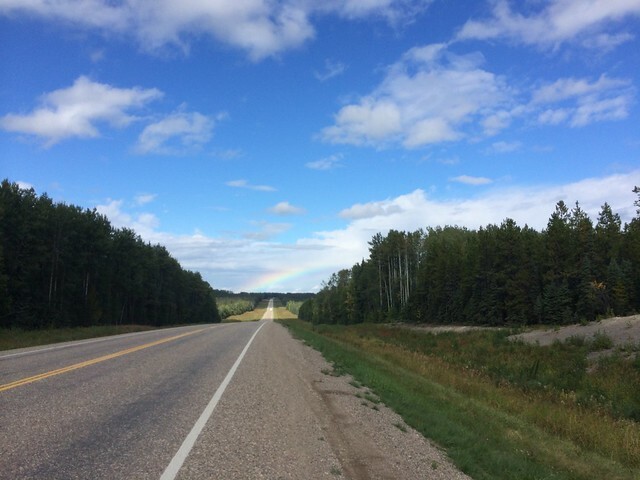 The ride from Fort St. John to Fort Nelson was around 240 miles. The weather was very good. As per the forecast this was the last good weather day for another week. So I decided to take it nice and easy. However due to lots of road re-surfacing I was forced to go nice and easy anyway. The road out of Fort St. John started out well with wide lanes. I spotted a Gurudwara on the way out of the town. The highway was busy with huge semis hauling logs, oil, gas etc. However, British Columbia was ready for motorcyclists. There were many such signs. 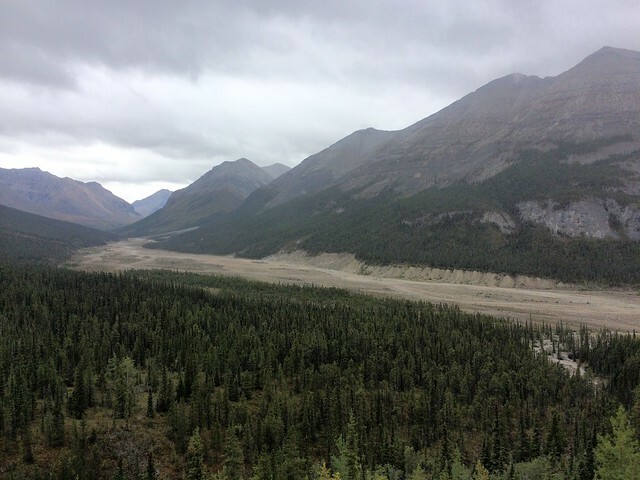 This stretch of the Alaskan highway was dotted with log mills, oil and gas fields. Lots of the big petro and energy companies had operations here. This has driven up the cost of living around here. I paid quite a bit for the motel room (almost $120 for a single person). The highway wound through wild forests. Some parts of the forests looked re-forested after, I guess, human impact. There were many small dirt roads shooting off to the sides into the forests leading to many of the logging and drilling sites. There were straight and long stretches of roads walled by the forests on both sides. It was very scenic. You could see for a mile or so straight ahead and an occasional rainbow. I would see quite a few of those over the next few days. 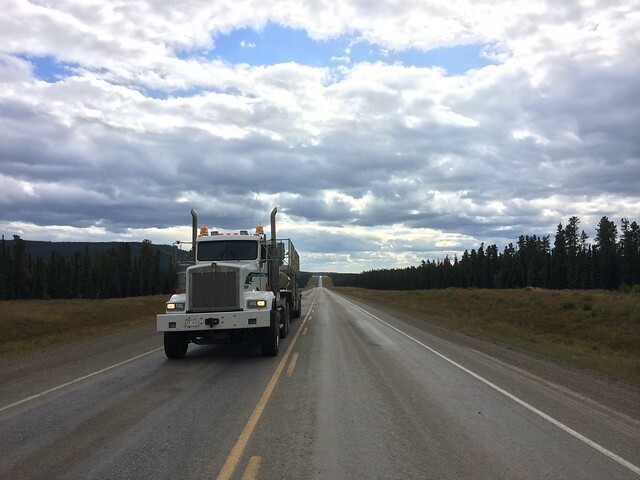 Hwy-97 until Fort Nelson runs parallel to the Far Northern Canadian Rockies. At certain stretches where the road is at a higher elevation one can see a large valley tens of miles wide filled with tall coniferous trees of a uniform dark green. It was like a dark green river flowing in the valley. Couldn’t really capture that in a photo. The day soon ended with a looming sense of dread. The next few days was going to be wet, wet and wet. I booked my hotel for tomorrow night, made a few phone calls and slept early. I woke up early today and left quickly since it was going to be a long day; a long ride in wet weather. My destination today was Watson Lake. Fort Nelson, BC lies on the East of the Far Northern Canadian Rockies. Watson Lake in the Yukon Territory is around 500 kms (300 miles) further north on the Alaska Highway. The highway runs north-west through the heart of the Rockies giving you a glimpse of its raw natural beauty. 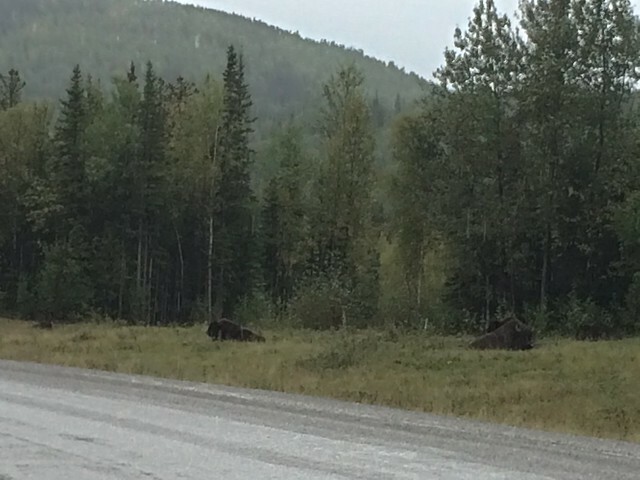 Within a few minutes out of Fort Nelson I had my first sighting of wildlife. I saw a young black bear feeding on something by the side of the road. I couldn’t slow down for a better look as there was a truck right behind me. Soon I was climbing into the Far Northern Canadian Rockies. As the elevation rose the temperature dipped. One of the passes was high enough for a birds eye view of the mountain range. There were quite a few construction sites along these mountain roads to resurface or pave the roads. They were all deserted with the equipment left in the open to fend for themselves against the weather. I had to ride through the gravel slowly. After the pass the road slowly made its way down to the valley floor. The Alaska highway passes through the rest of the Rockies on the valley floor; snaking between high mountains, besides lakes and rivers. The valley floor isn’t very wide and the mountains on either side seem very near unlike the Death Valley in California which can be 10-15 miles wide at most points. I stopped to fill gas at one of the many small truck stops and RV parks. This one had an interesting sign on it; definitely posted to shut up all the glampers from the cities. The vistas along the route were simply stupendous. I wanted to stop more often than I did for photos but the cold and wet weather did not make stopping a pleasant experience. There were sights of mountains lined up endlessly one behind the other, each one a bit fainter and grayer than the one in front of it. They were each awaiting their turn to show you just how special they are. There were green mountains, gray mountains, brown ones, black ones and some white ones too with swift turquoise blue rivers washing their feet. Such variety in such proximity! I will not disagree. 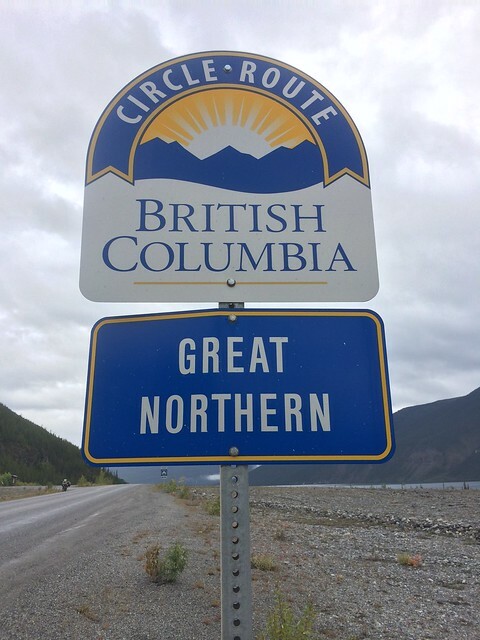 This was indeed the Great Northern! I saw some more wildlife as I rode further. A couple of Elks darted across the road once while herds of bison munched on green grass by the roadside. It was quite exhilarating to see these giants from a close distance whilst being completely exposed on my motorcycle. I stopped at what I felt was a safe distance to take photos. Another tourist couple in a car decided to stop right in the middle of the herd for photos making me quite nervous. I don’t think I could have outrun a charging bison if things went sour. Later on I saw another bear run across the road around 50 feet from me. 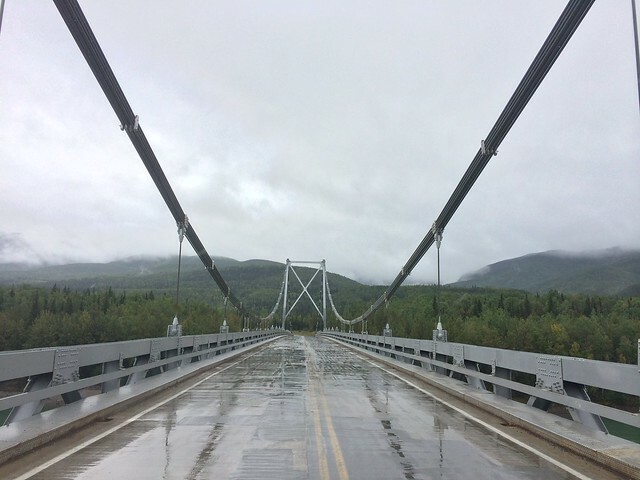 The Liard River suspension bridge built in 1944. 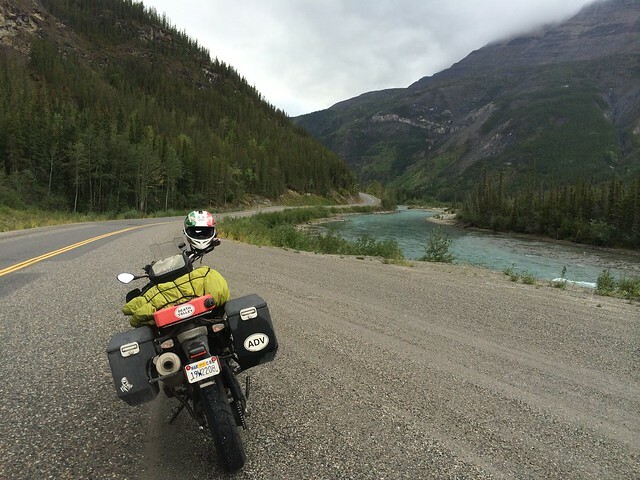 The Alaska Highway follows the river for some distance. 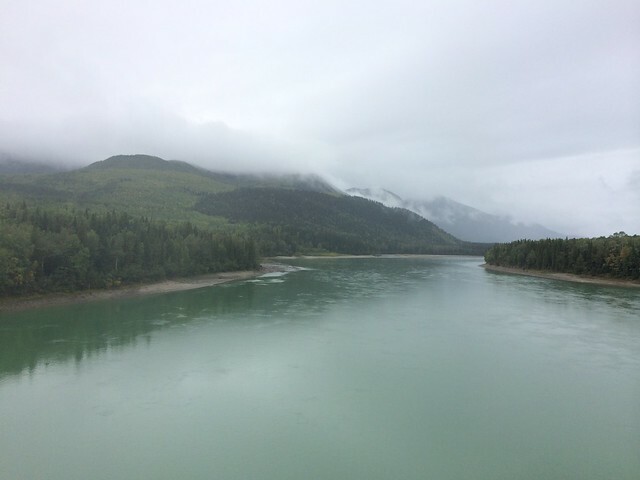 The Liard river looked magnificently cyan in this weather. Until now there was no rain. Just low hanging clouds and temperature hovering around 50’F. However, once I reached Muncho Lake a steady downpour started. This would continue all the way to Watson Lake. Quite a task riding through this rain. The spray off the large trucks made it very tough. Visibility is nearly zilch in the wake of a truck. Them being slow and me not wanting to be stuck behind them, constantly wiping the spray off my visor, made it very tricky. You have to pass them to avoid the spray but that involves making a leap of faith into that misty wake hoping that you can emerge on the other side without hitting any oncoming vehicle or wildlife. My least favorite part of the ride. 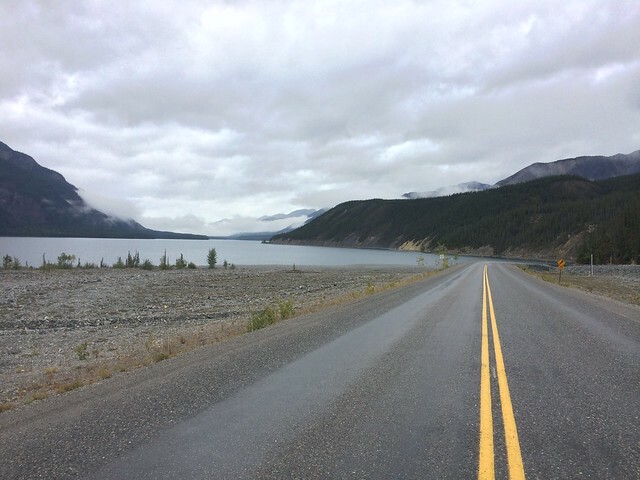 The Alaska Highway, as it neared Watson Lake, switched back and forth across the British Columbia and Yukon Territory border a few times. Here are the best welcome signs I saw. I arrived at Watson Lake around 6:30 and went straight for dinner at a local truck stop recommended by the lodge owner. My accommodation for the night was the historic Air Force Lodge. It is the oldest building in town and was used as barracks for the pilots during the second world war flying from an air strip which actually predates the Alaska Highway. This was a very interesting lodge. Very clean, the owner made me take off my boots at the door. 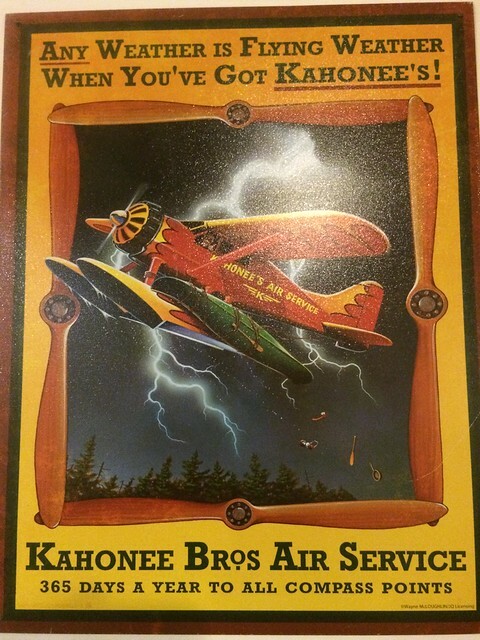 The walls were adorned with interesting posters and pictures such as this one. The owner, sounded German, had soft music playing in the hall. The rooms were tiny but clean and comfortable. There were common showers and restroom typical of a military establishment. Another rider, a Brit, riding a Triumph Tiger 800xc showed up right after me. He too was dripping wet. He had been on the road for 10 months. Started off northwards from Argentina and now was on his way back down after getting to Prudhoe bay in severe conditions. His report convinced me that I had no business going further north than Fairbanks. He used to be stationed in the arctic circle with the British Army. Tough fella. I sorted out the accommodation for the next day at Haines Junction before I turned in for the day. 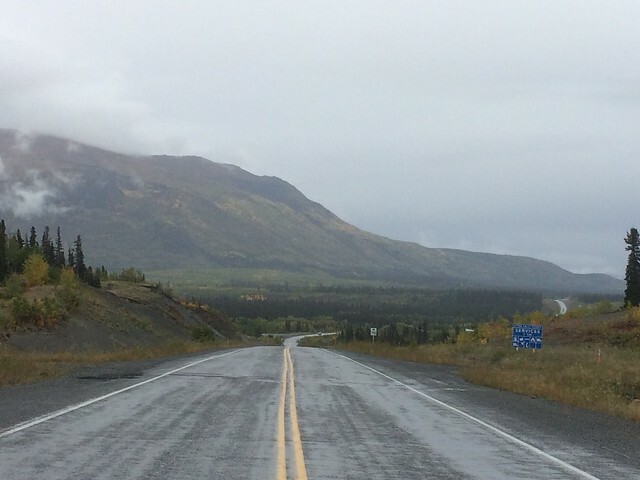 It’s a long drive to Haines Junction and the Alaska border is getting closer and closer. I woke up and left Watson Lake early today. I was out the door by 8:30am. I had figured out what was wrong with my heated gear setup and set it up right and had both the gloves and the jacket firing up. The trick is to start the bike first and then turn on the heated gear. If it’s on when the bike is fired up the power surge shuts off the heated gear. The warmth felt so good that though it was pouring very heavily I was comfortable enough to keep going and not stop for breakfast at Watson Lake. I decided to get some miles under my belt before breakfast, brunch rather. 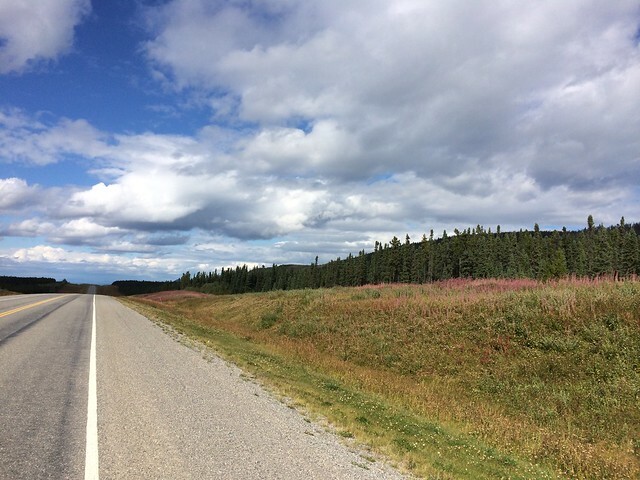 I rode nonstop for about 160 miles until Teslin, Yukon. I had brunch at a truck stop. The waiter at the cafe mixed my order with another persons. I realized this just before I was about to have the first bite. I flagged the waitress down and told her of the mix up. At first a bit confused she hesitantly asked the other person if he wanted his food since I hadn’t eaten any of it. He just shrugged and said ‘It’s Yukon’ and took it. Try that elsewhere. I filled up gas in the pouring rain and as I was gearing up I got chatting with a couple of locals who warned me about the weather and road conditions. They told me to take it easy and slow which was fine by me. One of them a road construction guy said to watch out for potholes going north. I hadn’t seen any so far but there were small potholes about 6-10″ in size scattered around. Good advice. Just as I left Teslin I realized my low beam was busted. 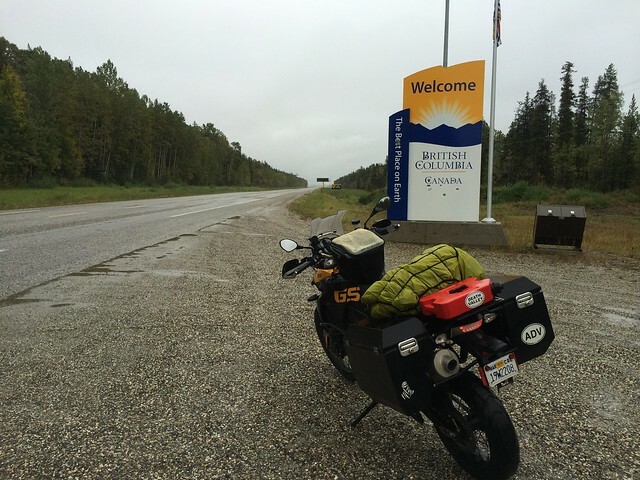 I wasn’t carrying a spare bulb and there wasn’t a motorcycle store in Teslin. I rode out anyway with my high beam turned on hoping to find something at Whitehorse. Next was Whitehorse the capital of Yukon. It looks like the state’s biggest city. Lots of museums and other attractions. 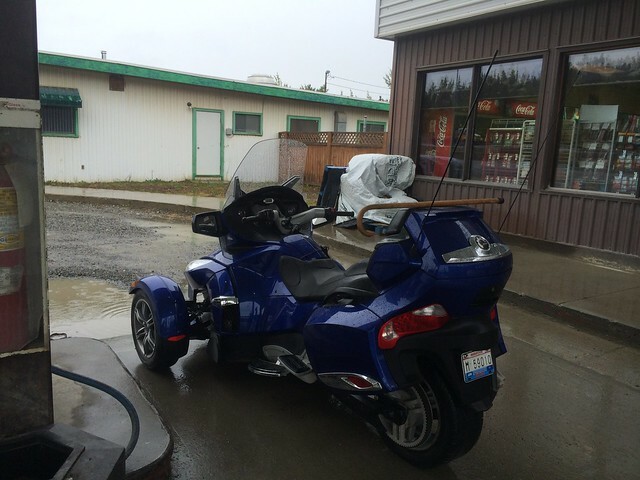 While filling up gas I saw an old man with a walking stick riding a big canam spyder. It was raining heavily but he looked quite happy and cheerful. That gave me some confidence as I continued on to Haines Junction. 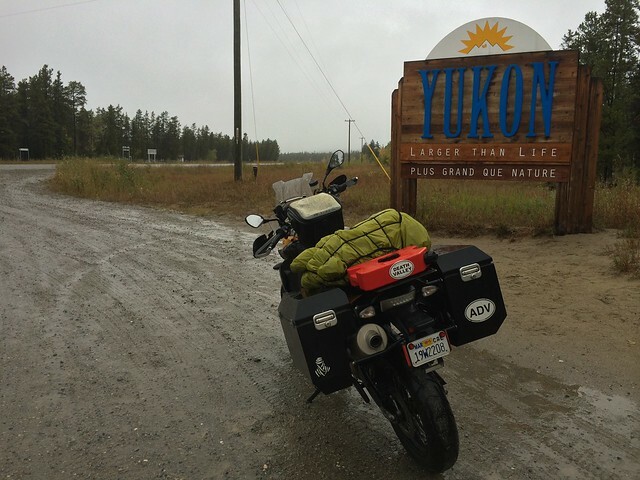 I couldn’t find any motorcycle store at Whitehorse. Oddly I wasn’t too worried and I rolled with it as the high beam was working and I was sure I wouldn’t be riding at night. I didn’t stop much for photos today. I just watched the scenery flow past me. Fall had come to Yukon. For the past few days I could see a few yellow trees. Yukon had plenty. Mountains covered in trees turning yellow and red. It was pretty. 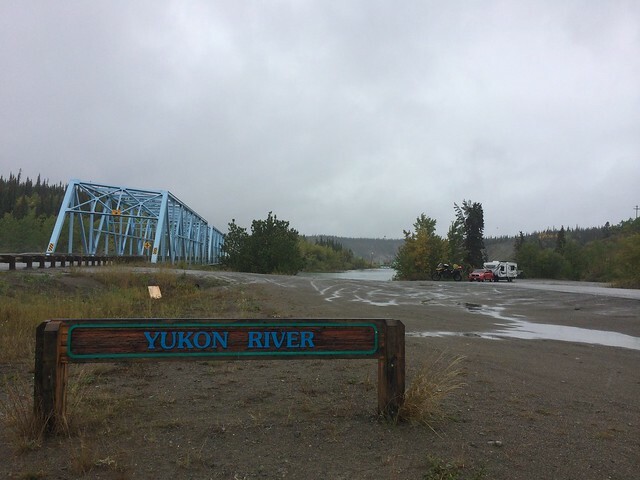 I even passed the famous Yukon River. I had to stop for a photo. It had rained all day. All the way to Haines Junction. It was cold too; around 40-45’F all day. However at Haines Junction the weather was quite nice. No rain. There were clouds blocking out the sun but there was some warmth in the air which was quite a relief. The roads are damp with some dry patches. This small town is at the edge of the Kluane National Park of Reserve of Canada. 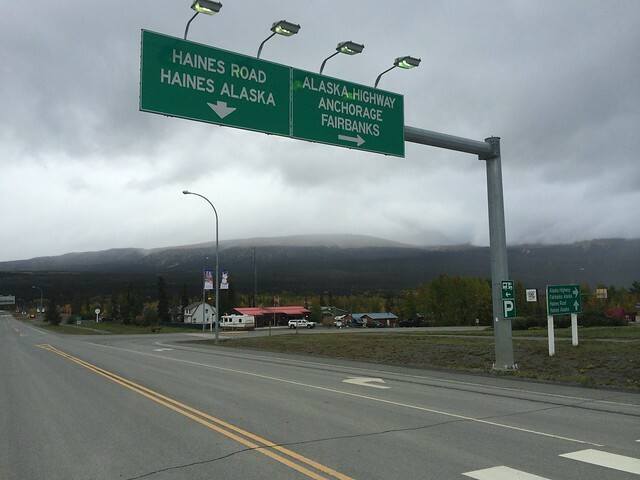 It is the last Canadian town on Alaska Highway going north towards Fairbanks. 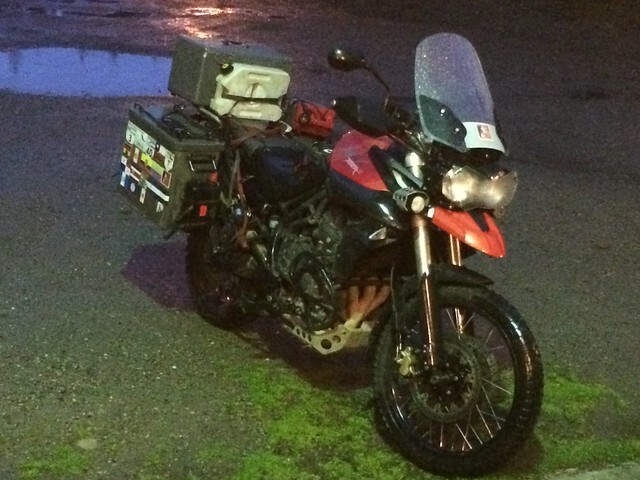 I saw three Polish riders on two KTM 1190s and a BMW R1200GS. They were on their way back from Alaska. They had some serious kit. All sorts of gear and accessories. They said that it was cold and a bit icy on the road north. I wasn’t surprised as the blizzard I had been tracking along with Karthik just passed through there. The gas station owner suggested turning back saying that winter is early this year. The motel owner however said that this is just a blip and serious winter will kick in only in about 2 months. The ice on the road melts away by midday so it’s best to not set out early in the day. I am slightly troubled with timing my trip right to avoid icy roads. I have a ferry out of Haines, Alaska on the 21st. I might have to cut down my time in Alaska to make sure I get to Haines in good weather. Another topic for discussion with my weather and travel counsellor. 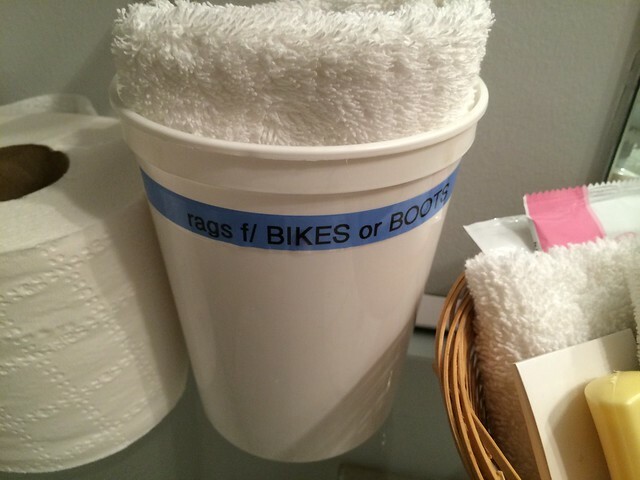 The Alcan Motor Inn I am staying at is motorcycle friendly with rags specifically for cleaning bike and boots! I walk around a bit and head to the local restaurant for dinner before calling it a day. I am so close to Alaska!! My next post will take you through the rest of my journey which takes a unfortunate turn and shows me how fragile things can be and how, no matter where you go, people are willing to help.